(P&R, 2003/2004), pb., 215 pp./ 275pp. I have been meaning to write separate reviews of these books but time is passing so I decided to address them together. We completed vol 3 just before Christmas, and I must say that after the Chronicles of Narnia this is the best series we have read. We accidentally left it behind as we left for oru Christmas travels. We called a friend and she met us along an later part of our travels to get us the book so we could keep reading it! My wife, who is typically caring for our 8 month old daughter as I am reading to the boys, has begun reading the series for herself after hearing just a portion and being captivated by it. We read the final pages of Rebel’s Keep on the road and she teared up significantly. I can’t say enough good things about these books. I might add some clarifications though. One friend commented that the books were hard to read aloud. They are very well written and much easier to follow that many other books we have read. I think he was referring, however, to the use of some Scottish words/pronunciation. I think I did not think to mention this previously because we became accustomed to some of what is in the book while living in Scotland. There is a glossary in the back of the book which is helpful although not every potentially confusing word is explained there. An important word to understand is “ken” which means “know.” Also “Och” and “Och, aye” occur frequently. They mean almost nothing really, something like “well” in American speech. There will be place for some stumbling with some of these words but perseverance wil pay off richly. I now hear my boys from time to time playing saying “I donnae ken” (“I don’t know”). Secondly, these books are aimed at older kids- the cover suggests ages 10-14. I think these 2 volumes are a bit tougher than Duncan’s War. They are not profane or illicit in anyway. They simply deal straightforwardly with the suffering and death inflicted upon the Covenanters. My 6 and 8 year old boys appreciated it just as much as my 10 year old boy, but you will need to consider when your own children are ready for this. It is not gratuitous, but it is gritty. These books have real substance, a compelling, adventurous plot, good theology, thoroughgoing worldview and are written so well. Rarely do all these elements come together so strongly it seems to me. Lastly, I should say something about the specific contents of these volumes (!). King’s Arrow begins 13 years after the final events of Duncan’s War. By this time Angus has grown to be a young man who has continued his childhood interest in the bow. He has become a skillful archer and that plays a prominent role in the books. This book concludes with the (historical) battle at Drumclog. Rebel’s Keep then picks up in the same year. In Rebel’s Keep Malcolm, Duncan’s son takes on more of a role as well. Each of the three books concludes with a historical battle. The final volume resolves the issue of the M’Kethe family’s situation, but I’ll not spoil it by saying more. Lastly, one other great element of the book is how naturally historical people and events are interwoven. My boys often said, “Whoa! So you mean he was a real person!” A list is given in the back of the names who were real people. This, along with the manner of writing, sets these books above the books we enjoyed about the Huguenots and the battle for independence in the Netherlands. Merry Christmas from our family to you. Enjoy some extra time for reading together! This is a great illustrated story book for younger kids about the birth of Jesus. 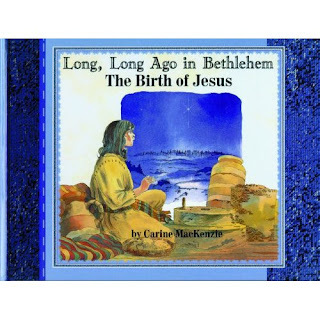 Carine McKenzie is our favorite bible story author. She is always faithful to the text and often points you to larger theological truths. The book is also illustrated by Fred Apps, one of our favorite illustrators. The story is simply told, basically a faithful retelling in simple form of the actual biblical texts. Along the way pertinent texts are given an entire page to be quoted in full. 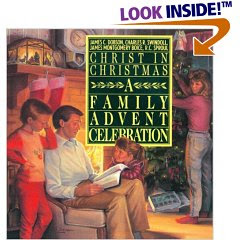 The illustrations are engaging, making this a good way to read the Christmas story with smaller children. With children a bit older you can tease out some of the implications of the Old Testament prophecies, etc. This has been our favorite and most used advent book since we have had children (and perhaps before). The book is arranged in four parts, one for each of the weeks of advent. Each week contains an essay by one of the authors listed and has a specific Christmas carol. Then each day of the week has a specific Scripture reading. The Sunday reading is typically longer than the others. This provides you with a specific reading for each day of the season. Questions are provided after the essays and there are some suggested family activities. We have not often used any of the activities. The best part of the book is simply its arranged readings. It gives you a great list of Old Testament messianic texts. Our family has used the book in various ways. It is a great resource. A reader has written asking me about posting on some books on Advent or Christmas. Great question! I have meant to post on some but have been behind. I previously commented on Gabriel’s Magic Ornament, written by one of my colleagues. It is a really good book. I will be posting on some other books in the next few days. (Zondervan, 2000), hb., 211 pp. I came across this book second hand and was really excited about it. According to the introduction the book contains some of the stories that Tolstoy thought were the most important he had written but they have not been very accessible in the past. Apparently, Tolstoy had gathered great stories from various cultures and reworked them. According to the translator, Tolstoy considered this book as the most important of all his works. “The stories in the collection you hold in your hand were selected from The Sunday Reading Stories. Because this last great volume of Tolstoy’s work has been neglected for so long, most of the stories in Divine and Human are appearing in English for the first time” (12). The prospect of uncovering ‘buried treasure’ particularly appeals to me so I was really drawn to the book. However, it has been a great, deep disappointment. Perhaps I should have known better, but the theology is so skewed as to make it unusable with my children. If he spoke simply to general truths (valor, faithfulness, integrity, etc.) it might be useful in spite of his overall theology. However, Tolstoy here is seeking to address the foundational issues of spirituality, sin, forgiveness, etc. In doing so he is significantly flawed. He displays a very poor understanding of atonement and forgiveness. Let me point to a few examples. In “The Son of a Thief” a respected businessman is called upon to serve on the jury for the trial of a thief. In the end he says he cannot pass judgment on this man who is guilty because he, himself, was the son of a thief. The businessman says, “I cannot judge others. To do so is not a Christian thing, your honor. We should forgive other people and love them.” The story ends with the judge stopping and considering “whether, according to the laws of Christ, it was possible to judge others.” This is a prime example of what many today think Christianity teaches. It is terribly wrong. The gospel is not, “Surprise! God did not really mean all that stuff about hating sin and judging sin.” We need to return to Romans 3 and see that God will indeed judge all sin. The only way forgiveness could be offered is by Someone else taking the punishment. Tolstoy totally misses the need for and point of the atonement. Further, 1 Cor 5 (as one example of many) shows that we must confront, rebuke, even ‘judge’ sin. Only when sin is rebuked can it then be forgiven. “It is true that he does not understand me properly. Not one man living is capable of understanding me as I am. The wisest of the whole human race are just as far from really understanding me as this man is. I look not at his mind, but at his heart. The heart of this man searches for me, and therefore he is close to me” (35). Again this thinking is alarmingly common today, but it is far from the biblical witness. True, the wisest of us cannot discern God on our own. But the result of this according to Paul is that we need for God to reveal himself to us through the cross (1 Cor 1:18-2:5). Those who embrace the truth of God revealed in the cross do in fact understand God in a way far beyond those who do not accept this truth- not by their own doing but by God’s gracious work. Furthermore, Tolstoy makes the common error of suggesting that if God just looks on our hearts he will be pleased. The fact that God looks on the heart does not relieve me of awareness of sin, but worries me all the more. Only certain sins creep out into actions, but our hearts are full of wicked thoughts and desires. No, our hope is not in God “just looking on our hearts,” but in God changing our hearts (Ezekiel 36:26), in God judging our sin on Christ rather than on us (Romans 3). So, since Tolstoy is trying to do theology and since he does is so badly, this is not a useful book. It is unorthodox and even blasphemous (the picture of God in the story with Gabriel). The one way this book might be useful (and the reason I will keep this copy) is that it represents many of the common false ideas about the gospel which are current today. (Random House, 1985), hb., 208 pp. Since I recently posted on the value of fairy tales, it seemed right to recommend a good book of these tales. We have not sampled widely of various collections, but we have found that we like this collection. It contains “nineteen classic European fairy tales” (in the words of the Introduction). Thus, this is a good source for many of the classic tales. Faerie Gold, the book mentioned in the previous post, though it has the wonderful essay on the value of fairy tales, does not contain classic tales. Instead it contains rather obscure ones, several of which were not all that great in our opinion. In contrast, The Random House Book contains classic tales such as “The Emperor’s New Clothes,” “Rapunzel,” “The Steadfast Tin Soldier,” etc. (you can see the full table of contents here). The classic tales are here retold without dumbing down or p.c. revision. Interestingly, the book contains an "Introduction" which argues for the value of fairy tales for children. The argument closely follows C. S. Lewis argumentation. It sounds like the author was influenced by Lewis, though I cannot be certain. My 6 year old has enjoyed reading this book on his own. This is one of the best books we have ever read. That is saying a lot, but it is true. It is similar in strengths to the “Martin and Boudewyn books” (as we call them), but surpasses them. It has adventure, intrigue, humor and strong Christian figures. The story is set in 17th century Scotland, the time when the Covenanters were being persecuted by King Charles. This is a significant time in the history of the Church but one that in my experience few American evangelicals are aware of. I became aware of it while we were in Scotland and have benefited deeply from reading about it. Thus, it was a joy to be able to introduce my boys to it early in their lives. The story revolves around rising persecution and how the M’Kethe’s, a faithful, Covenanting family, will respond. This, however, is no one sided story. Bond is clear in his affinity for the Covenanters but also portrays hotheads on that side. Duncan, the main character, is a young boy who keeps the family sheep and dreams of glory in battle defending the rights of Christ and Covenant. His father, however, seeks to temper his son’s enthusiasm by holding firmly to the necessity to honor the King and to seek peace. One of the most compelling elements of the book is how Duncan’s father seeks to be completely faithful to the Scriptures in all situations eschewing hotheaded vengeance but reluctantly taking up the sword when necessary to defend his neighbors and family. When he finally does fight, he explains to Duncan that they do so in obedience to the command to love their neighbors. He loves his neighbor by fighting to rescue and elderly main from the torture of the Redcoats and by keeping those same Redcoats from committing grievous sin for which they would have to answer to God some day. A powerful, faithful and very sensible just war theory arises from the discussion- not in an abstract philosophical manner but in a very concrete way. This is a great thing for young boys. Young boys have a natural affinity for conflict, and that is not all bad. However too many other things either encourage this uncritically or condemn it outright. This book teaches them to wrestle with the Scriptures desiring obedience over all else. It teaches faithfulness despite all, the willingness to suffer and the clear rightness of defending others. The story eventually leads to the historical battle at Rullion Green. One of the great aspects of the book is how Bond so naturally weaves his fictional characters into real events and into encounters with key figures of the day. The horror of battle is not downplayed. Duncan then becomes an example of real grit and courage in risking all to save his father. With the battle and subsequent hangings, this is not light stuff. The books are advertised as being for ages 10 to 14. My boys at ages 6, 8, & 10 loved it, but I did edit a bit. Bond is never gratuitous but he is dealing with persecution. There is so much that could be said, but I will mention two others. One of the explicit points that Bond raises through the characters is why God allows the righteous to suffer. Duncan wrestles with why God allows the Covenanters to be persecuted and then why God would allow them to lose the battle. Why does God then allow godly men to be hanged by their persecutors. His interaction with his father on this topic is very helpful. With this topic and others we had a book that my boys loved which also raised significant topics of conversation for us. More than once during our reading and since I have been able to use events form the book as examples for instruction and exhortation. Lastly, as I have alluded, Duncan’s father- Sandy M’Kethe- is one of the most powerful compelling features of the book. Here we have not simply an example of a strong, Christian man, but more specifically a father. Duncan’s hero is his Dad. Duncan’s best example of faithfulness, his key source of biblical instruction is his Dad. When Duncan is not sure what to do, he ponders what his Dad would do or say. When tempted with sin he worries about disappointing his Dad. This is excellent stuff both for encouraging sons to look to their father and in encouraging Dads to be this sort of man for their sons. Sandy M’Kethe is not perfect. He is open about his fears and deals honestly with his failures. 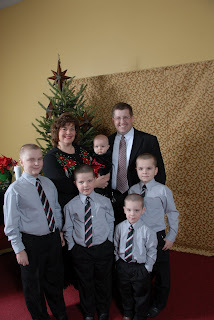 He leads his family by teaching them the Scriptures and leading them in singing the Psalms. Fathers, read this book to your sons for your benefit as well as theirs. This is probably more of a boys’ book. I would recommend it strongly for any family with boys. It would make a great gift to encourage boys and fathers.